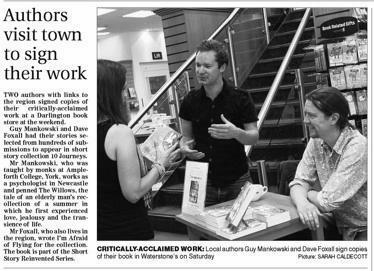 Last Saturday I joined the laconic and charming Dave Foxall at Waterstones in Darlington to promote Ten Journeys, the new Legend Press collection which we both feature in. Whether we simply had no shame pimping ourselves or whether the people of the North East were in a good mood I don't know, but we managed to sell out of copies during the signing. The Northern Echo came down to photograph the occassion - here you can see me standing up while Dave sits down. On the 11th September I'll be returning for another signing with Andy Kirby, ebullient and provocative author of the excellent novels 'Bully' and 'The Magpie Trap'. And while we're on the subject on 7th August I'll be promoting Ten Journeys at Waterstones Newcastle with Matthew Crow, author of the novel 'Ashes'. from Yes by the Manic Street Preachers. Ebullient and provocative... Which makes my writing style 'come and have a go if you think you're hard enough. 'Come and have a go if you think you're hard enough' just about sums it up I reckon Andy. You're the literary equivalent of Liam Gallagher.